While I was climbing Pacific Park on my bike today, someone threw a rock at me and nailed me right in the head. They had quite the throwing arm with pinpoint accuracy. Let me back the bike up for a minute and explain. I’m in love with mountain biking. I’ve never been a big fan of riding in traffic on busy streets and after today, I’m much less a fan. You could say I’m a complete non-fan. I had just looked down for a sec to look at my Google Maps app to see how close the street was that I needed to turn on to get to the trailhead. I looked down and then WHAM. I stopped pedaling, utterly confused because I knew I couldn’t have hit a tree branch because, well, no tree. Simultaneously, I saw the car speeding alongside me, saw the car full of Ohhhhhhhhh-nailed-her faces, and the sound of the raucous laughter. The car full of teenage boys saw that I saw them…and they continued laughing their fannies off while speeding away. Apparently, I made their day. They hit the old lady. The fact they had literally thrown a rock at me and were laughing at me made me tear up. And then that surprised me. I wasn’t angry. It hurt my feelings. Like, to the core. It’s interesting to me how quickly my mind went to the next thoughts. Thought #1: Maybe it was my fault. I had gone up on the sidewalk during that section because the bike lane was narrow and traffic was so congested. Maybe since I was potentially breaking a law, maybe I should get tagged in the bean with a rock. It occurs to me that blaming myself is not an uncommon thing I do when someone is mean or unfair. Thought #2: The sound of their laughter made me think of Kelly in elementary school. I flashed all the way back to Fair Oaks Elementary. Kelly had special needs and had been mainstreamed into our school and the kids routinely taunted and laughed at her. All this happened in a matter of a few seconds. I got off my bike and checked to see if my helmet was cracked. I could feel a headache starting and decided to walk the bike for a bit to gather myself. I shut off the Erwin McManus podcast I had been listening to (no earbuds, just speaker). Eventually, I got back on my bike and continued upward and onward toward my trailhead, which I never found. I felt overall a little discombobulated, so I gave up. Weirdly, I felt a little humiliated. Defeated. Unloved. As I began pedaling homebound, the five-word-classic-line came to mind: What’s this world coming to? What were they doing driving around with a rock in their car? Did they have a bag of them, were they out joyriding, trying to see how many bikers they could tag? Was it a game? Or was it even a rock (I couldn’t find it because of the dense bushes behind me). Or was it a spontaneous thing and, aiming for my noggin, they pitched a full can of coke or maybe a beer from their speeding car? After my bobcat encounter last year while riding my bike on the mountain trail, I was pretty paranoid about the odds of seeing another. I met a man on the same trail who said that I shouldn’t fear animals, I should fear people. I’ve thought of all sorts of dangers while riding my bike, but I never imagined someone hurling a rock at my head. I couldn’t avoid all the busy streets to get home, but I was getting close to the paved path section that was off-road and away from the cars (an actual bike path). I thought about the current culture of meanness in our country and the phrase hell-in-a-handbasket came to mind. We are so far off the rails. I am stunned by the lack of civility and even cruelty I see every day in the news. News that I often feel powerless over. Now out of traffic and onto the paved bike path, I turned my podcast back on and heard Erwin ask, “Have you ever been hit by something you did not see coming?” He went on to talk about literally getting hit in the head by a flying object. Um, yes, as a matter of fact, Erwin. It seems to be a theme these days. 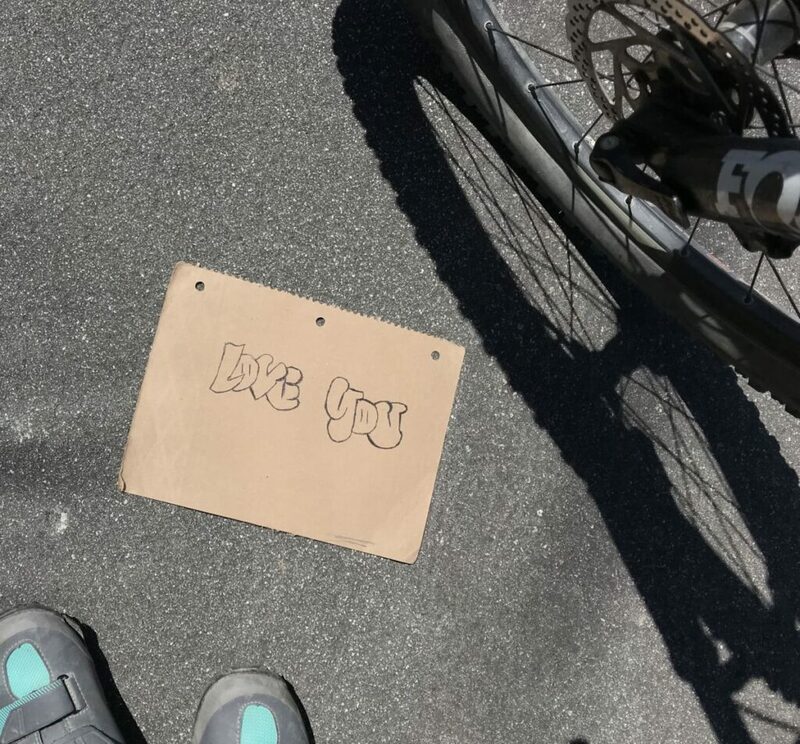 And then a moment later, my front tire rode right over this cardboard sign that says love you. My head and heart were hurting and I’m still a little dingy now, so I’m not sure what all of this means but I do think someone had just said, I know you get blindsided by meanness. I’m here. Head up, heart open. I love you. Ride on.